What Day Of The Week Is August 2? 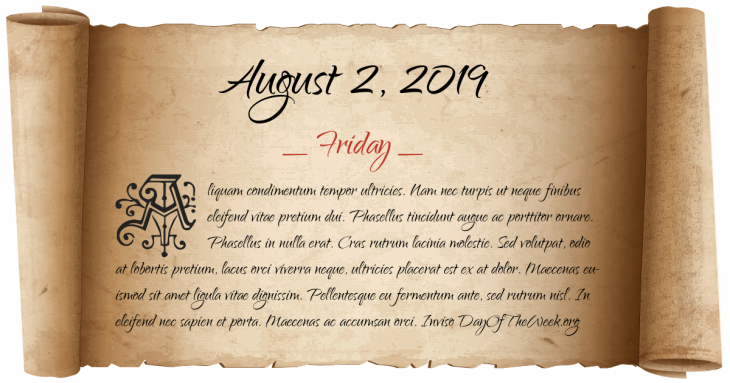 August 2, 2019 is the 214th day of the year 2019 in the Gregorian calendar. There are 151 days remaining until the end of the year. The day of the week is Friday. A Macedonian army led by Philip II defeated the combined forces of Athens and Thebes in the Battle of Chaeronea, securing Macedonian hegemony in Greece and the Aegean. Second Punic War: Battle of Cannae – The Carthaginian army led by Hannibal defeats a numerically superior Roman army under command of consuls Lucius Aemilius Paullus and Gaius Terentius Varro. Russian troops are defeated in the Battle on Pyana River because of drunkenness. Japan’s samurai, farmer, artisan, merchant class system (Shinōkōshō) is abolished as part of the Meiji Restoration reforms. (Traditional Japanese date: June 25, 1869). Tower Subway, the world’s first underground tube railway, opens in London. Fall of the Ottoman Empire: an unsuccessful uprising led by the Internal Macedonian-Adrianople Revolutionary Organization against Ottoman Turkey, also known as the Ilinden-Preobrazhenie Uprising, takes place. World War II: the Motor Torpedo Boat PT-109 is rammed by the Japanese destroyer Amagiri and sinks. Lt. John F. Kennedy, future U.S. President, saves all but two of his crew. Who were born on August 2?